The STEL-9941 high-performance single channel S-band synthesizer combines Direct Digital Synthesis (DDS) with microwave mix/divide circuits to accomplish advanced performance specifications, including a frequency resolution of 0.7 Hz, switching speed of 150 ns, and high spectral purity. 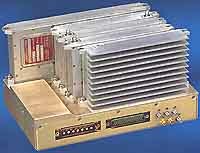 Standard models operate from 1.6 to 2.8 GHz. Due to its modular design, several performance options are available up to 18 GHz with limited effect on lead times. These generic modules are attached to a common base plate with blind mate connectors. Readjustment is not necessary when changing modules, allowing for easier maintenance and logistics processes. N/A, 59 Technology Drive, Lowell, MA 01851. Tel: 978-441-0200; Fax: 978-453-6299.